At Molino’s, we believe in using only the highest-quality ingredients … especially when it comes to our fit and fresh menu. From our grilled and broiled dishes to our homemade salads and wraps, you can always find something delicious to fit your lifestyle. And with an extensive gluten free menu, we’re also your top choice of gluten free restaurants in NJ. If you live with Celiac disease and have special dietary needs, you can trust to eat safely and scrumptiously at Molino’s. We take great pride and care when serving our customers who have food allergies, so just mention it when you order and you’ll be in good hands. If you require a gluten free menu, you’ll enjoy a wide variety of options to choose from with our signature recipes and all-natural toppings. 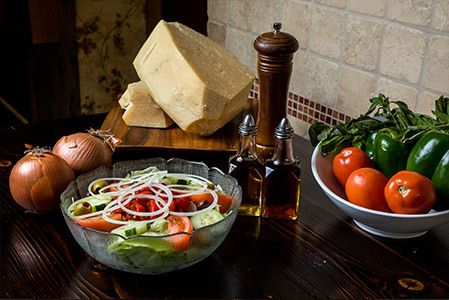 As one of the trusted gluten free restaurants in NJ, we never compromise on flavor and substance – not only with our pizza but with our pasta, too. Our gluten-free pizza crust uses honey as a binding ingredient and rice flour as a substitute. And you’ll find a full selection of pastas and gluten free foods as part of our fit and fresh menu. If you have a particular question about our gluten free menu, give us a call at 732-972-1180 and we’d be happy to discuss our ingredients with you.